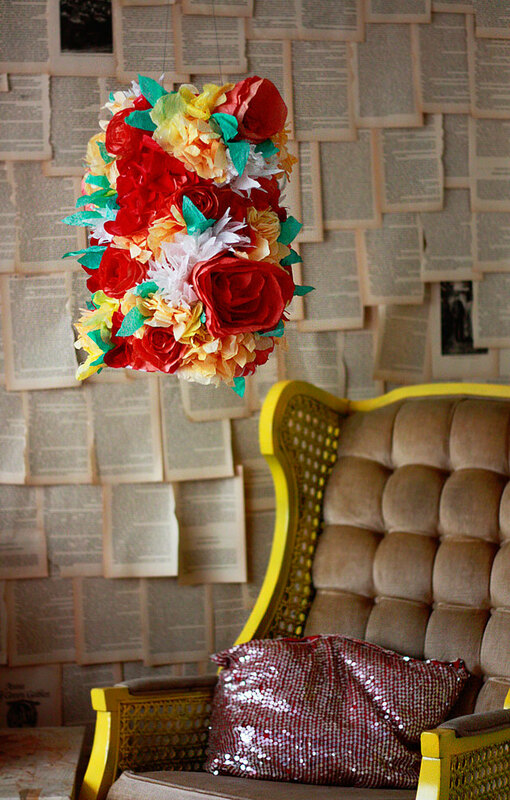 The best part about running a craft blog is seeing what happens when people take an idea and make it their own. As fun as it is for me to create things, it’s far more rewarding to see others make those things in their own special way. Sadly, I hardly ever get to see the outcome. With that in mind, you can imagine how thrilling it was to see these images pop up in my inbox. 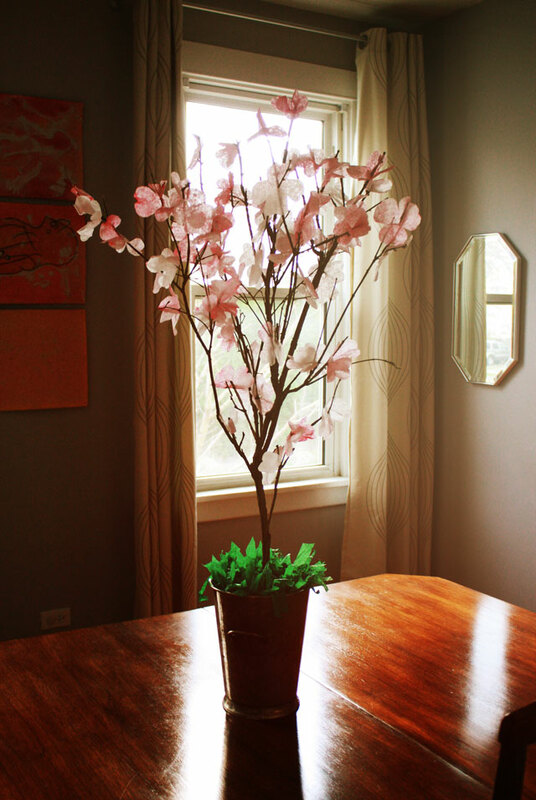 Stephanie, the bride, incorporated my cherry blossom coffee filter flowers into her Washington DC wedding. 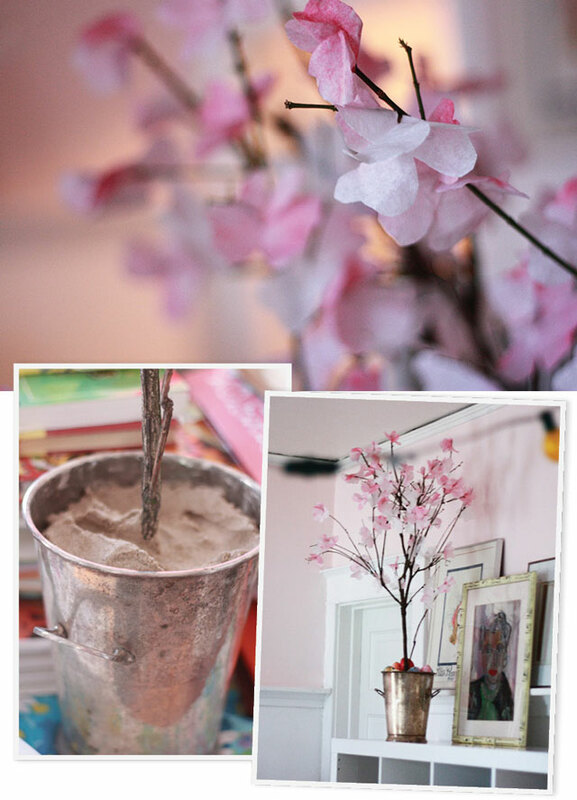 She used manzanita branches (Amazon) grounded in silver buckets (Ikea) filled with playground sand (Home Depot). Set inside a very swanky restaurant, they add just the right touch of color and festiveness. And, honestly, it’s Washington DC – what flower could be more appropriate than cherry blossoms?! Seriously, y’all. She even made a photo backdrop to make her cute friends and family look even cuter. Look at that cuteness. Stephanie, I am so delighted you were able to weave your creative talents into your special day (and if my tutorial helped in the process, even better!). Thank you so much for sharing this with me. Congratulations on your big day! 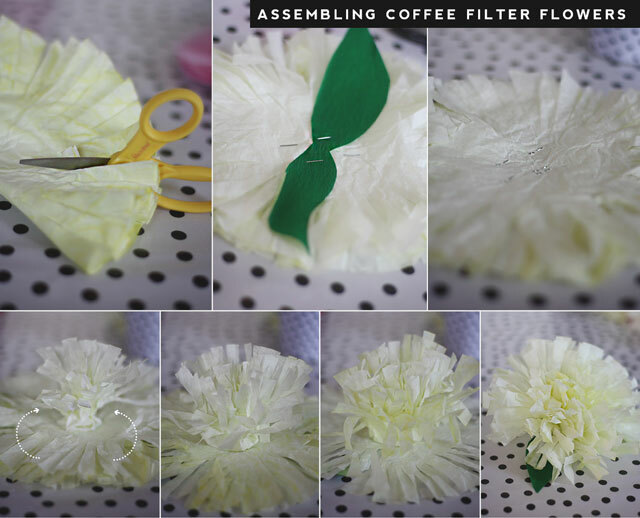 If you have been following this blog for some years, you know I got my start making coffee filter flowers. It’s my thang. I haven’t made too many in the last couple years, but that is about to change. I’m kicking off a new wave of coffee filter awesomesauce with these multi-color babies courtesy of Pentel. Okay. 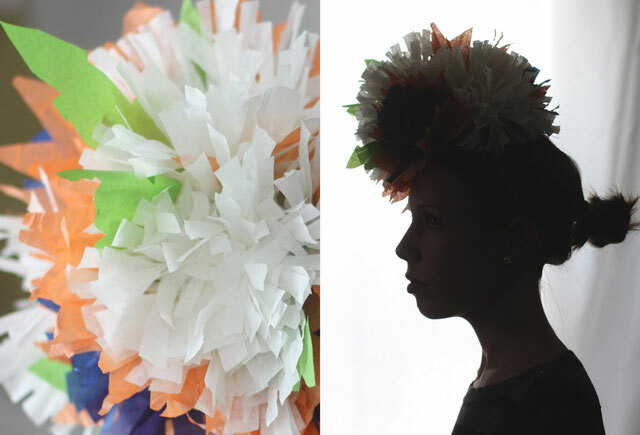 Literally, I have made more than a thousand coffee filter flowers in my day, but these are my favorite so far. The color stripes are blowing my mind. Best part is, these are super kid-friendly –no special skills required. And the color variations are endless. You could make these with a brownie troupe, or a flock of full-grown bridesmaids. Errrrrbody is going to love what they make and take it home to show their moms. And you can make hundreds of them for under $20. Bam. It’s that good. Now go over and check it out at Pentel.com! So, as you may have seen in my earlier post Easter Bonnets Part Un, a few weeks ago, I was fixin up some fascinator style hats the Saturday before Easter (yes, last minute is my middle name). 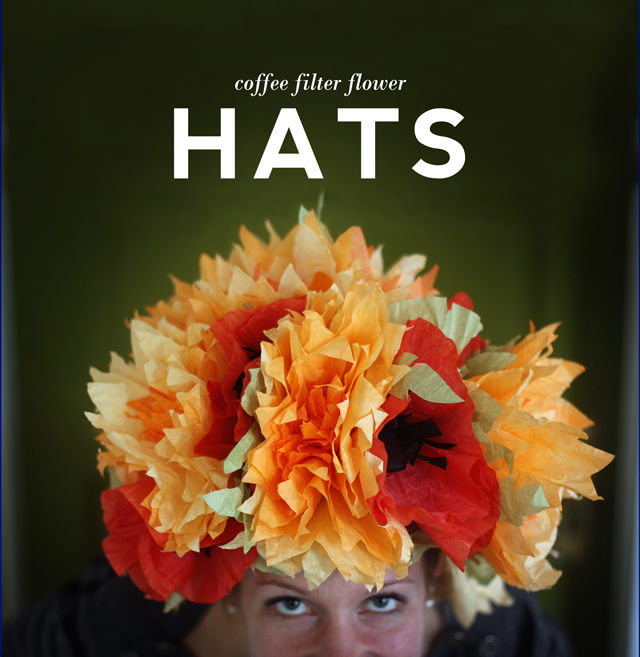 Anyway, so I am sitting there feeling very self-congratulatory about how cute those little hats looked when WHOMP I get an email from Michelle showing off Easter Bonnets made from using leftover coffee filter flowers she made using my tutorial. Well crap. How was I going to not make some great big kahuna hats like Michelle? Facinators be darned, it needed to happen! Before you read anything else, click over to check out Michelle’s hats. I just love it when this happens — one person puts something out there, then another person takes it in a another direction, then the first person grooves on it all over and again and tosses it back out. If Michelle and were musicians, I think this would make us a jam band. If you saw last week’s tutorial, this is just a variation on that. 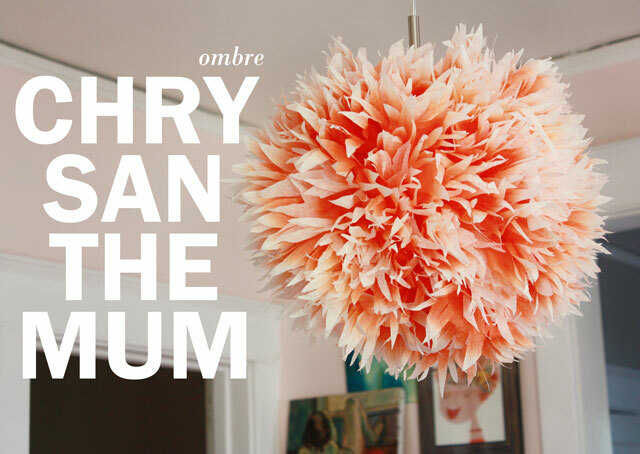 Instead of fringing and stapling one color of coffee filter to make chrysanthemum-like flowers, this uses layers of multiple shapes and colors to make peony-like flowers. Once you get an assembly line going, it’s easy to crank out a dozen of these suckers in no time flat. Hat Base. I am using a sculpture wrapped in a dish cloth to protect it from the hot glue, but a roll of paper towels wrapped in an old T-shirt will work just fine. Baseball Hat. You probably have one of these in your closet, or pick one up at a thrift store for 50cents. Pre-dyed coffee filters. Click here for directions , it’s very easy. All you need is food coloring and water. To make the turban below, I used 13 flowers, each made of 7 filters. That’s 91 altogether, plus a few green leaves, so let’s call it an even 100. You can buy 100 filters for a dollar at any grocery store. Start by cutting off the bill of the baseball hat. If you are left with a ragged edge, or just like the look, trim off the bottom with some green filters cut into leafs shapes. Or use some leaves cut from fabric or taken from a silk plant. Your call. Using whatever combination you see fit, layer 4-8 filters and staple four times in the formation of a square in the middle of the flower. One by one, pull and pinch each layer of filter toward the middle of the flower. Using the square of staples on the back as your base, draw a circle of hot glue and attach to the hat, starting at the outside perimeter and spiraling toward the center. There you have it. 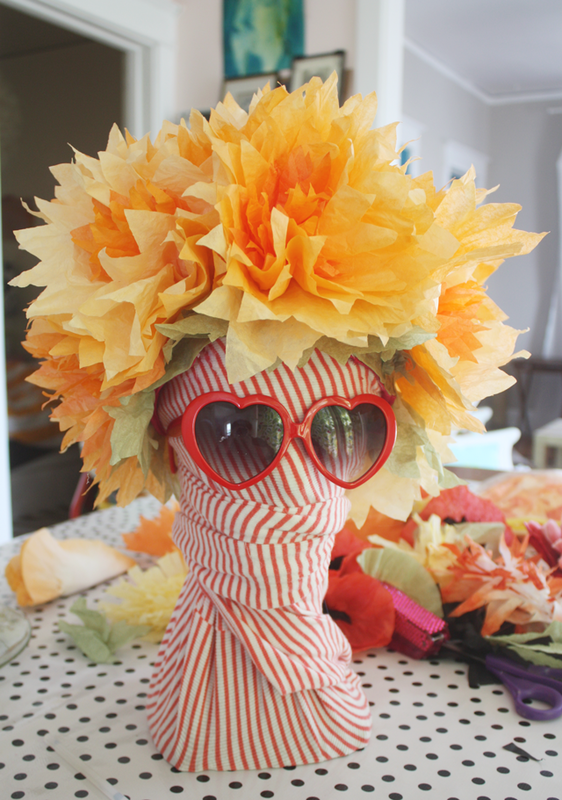 The flower turban to end all flower turbans! I decided this needed a little ooumph so I added a few red poppies I had sitting in my drawer-o-flowers. 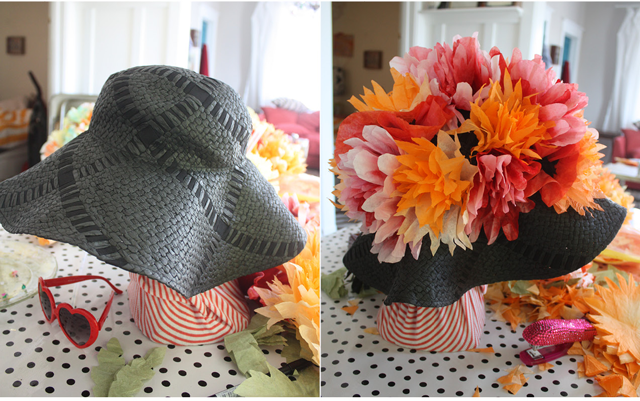 And while I was in there, I pulled out a bunch more flowers and attached them to a big floppy beach hat. 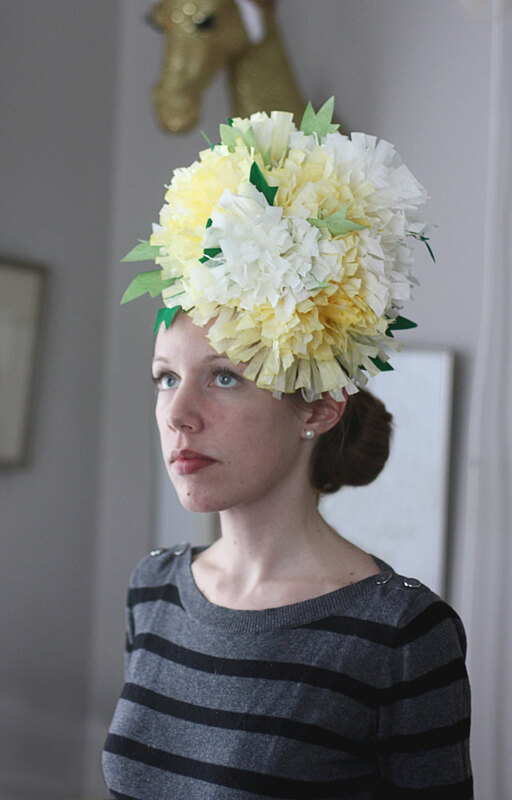 Actually, this is the way I made in the flower turban seen in my profile pic and the Matte Stephens portrait. One of my favorite long-time readers, a therapy pig named Stella Dora Von Swineburg, has been asking me how to make this for months now. I know Stella loves a good hat because she keeps a whole Pinterest board devoted to them. Stella, I hope you like this turban because it is now in a box and headed your way! So I’m at home last Saturday morning minding my own business when what do you know, a Judy Garland movie comes on the color TV: Irving Berlin’s Easter Parade. Honestly, who is going to do laundry and vacuum when Judy Garland is there all fresh faced and stomping her little heart out with Fred Astaire to When That Midnight Choo Choo Leaves For Alabam. Ain’t nobody got time fo that. Let’s be honest, Judy Garland always takes priority, but Judy Garland in hats is like the ultimate trump card. You can’t turn away. What’s that? Your college basketball team is two points away from winning the elite 8? You’re going to click over to ESPN to see the end of the game? NOT WHEN JUDY IS ON YOU’RE NOT. Judy’s headgear in this movie was so awesome, so chic, so frilly, I was inspired to make some last minute Easter bonnets. Seven to be precise. Do I need an Easter bonnet, much less seven Easter bonnets? No. This is the power of Judy and Irving Berlin. This! Modeling provided by my beautiful friend, Kiki Bird. 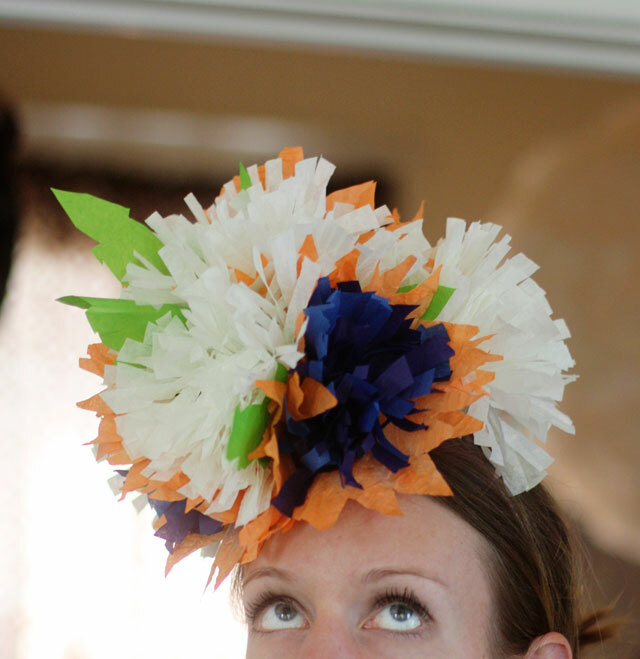 I decided to split this up into 2 parts: This week, Fascinators. Next week, full out Easter bonnets. Get ready people! 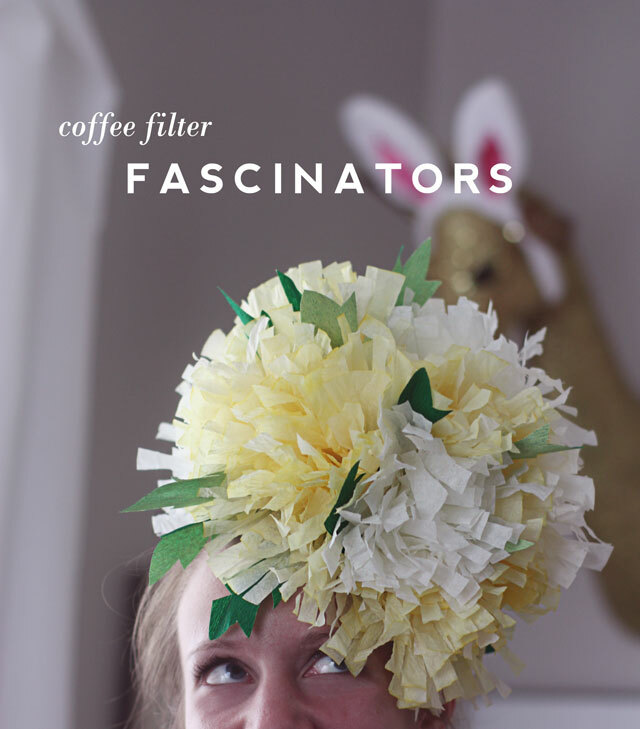 Note: I have covered coffee filter flowers on this blog a lot. For fear of being redundant, skip ahead to the assembly part. Hot glue gun and 5-10 glue sticks. 6oz paper cup. I’m using a cup/bowl used for serving frozen yogurt. 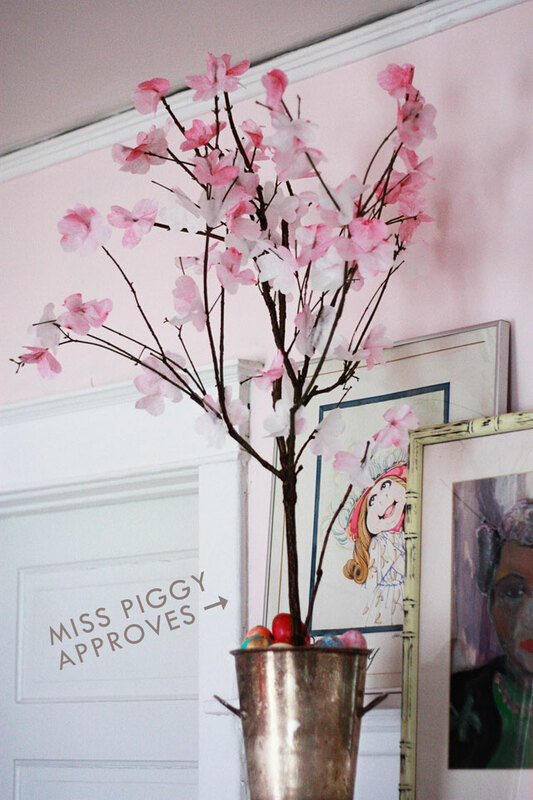 If you don’t have one laying around, use a regular paper cup and trim off the top 2” or so. Free. 10” of elastic trim. If you don’t have this in your sewing kit, use one of those elastic headbands, or trim off an inch thick tube from an old pair of nylons. Under $1. 10-15 hot glue sticks. Under $1. 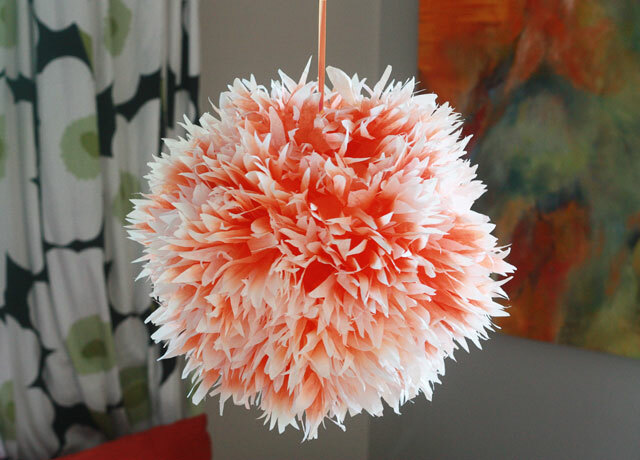 50 dyed and dried coffee filters. 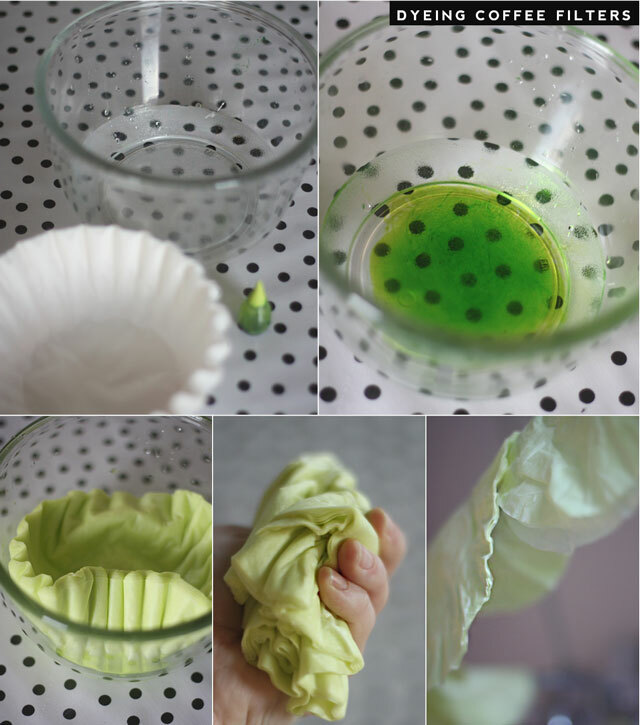 I’ll do a refresher on how to dye coffee filters with a few drops of food coloring below, but you might want to check the archives for alternatives. 50 cents. Green paper cut into rough leaf shapes. 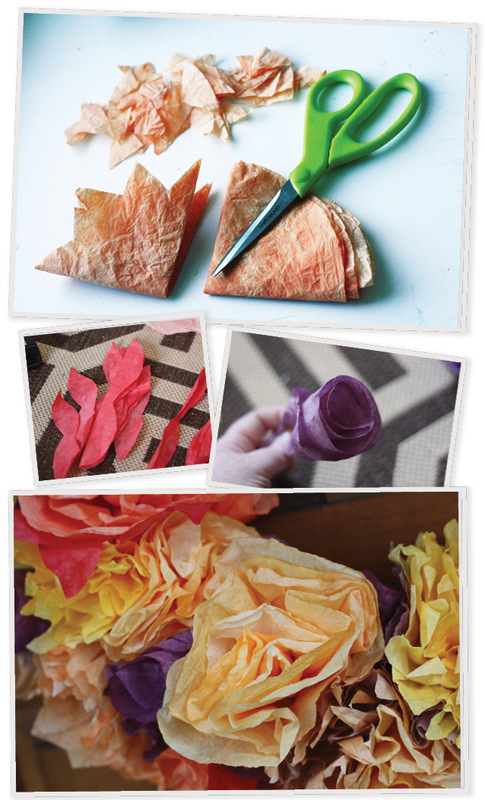 I’m using crepe paper, but tissue paper or green filters works fine. $1. Dying coffee filters pastel colors is easy as can be. Start out with easy-to-achieve pastels and work your way up to more saturated colors. 1. 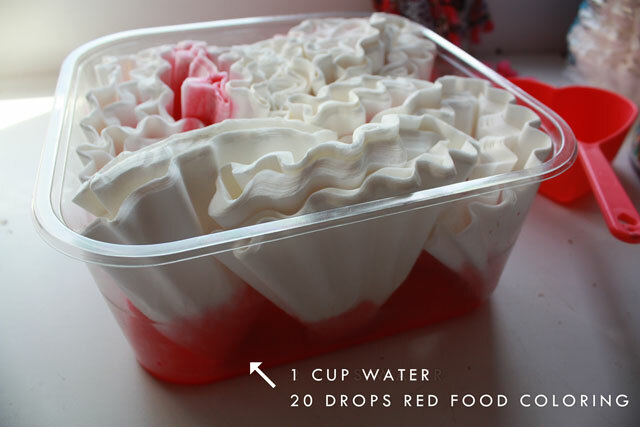 For every 100 coffee filters, you will need a few drops of liquid food coloring and one cup of water. 2. 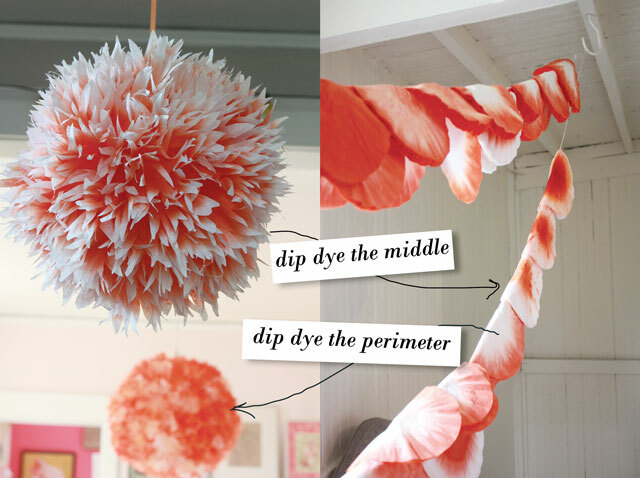 For a basic pastel color, squeeze 4 drops of color into the water and mix (see dye recipes below). 3. Keeping them in a stack of 30 (or so, this is very approximate), insert the filters in the bowl and let them soak up the color. You may want to punch on them with your fingers a bit. 4. Squeeze out excess liquid. 5. Divide into stacks of 5-10 filters and hang them over your shower rail to dry over night. You can speed the process by throwing them in a dryer, or a warm 200F oven for 10 -15 minutes (check frequently). There is no reason to separate the filters into individual pieces, in fact, it will make the next part harder so I would discourage it. Short stacks are best. 1. Working in stacks of 5-10 filters, fold the filters in half and cut 2″ fringes around the perimeter. Leave the center 3″ (or so) uncut. Sharp, heavy-duty scissors are going to be helpful right about now! If yours are dull, try cutting a folded up piece of tinfoil to sharpen them a bit. 2. 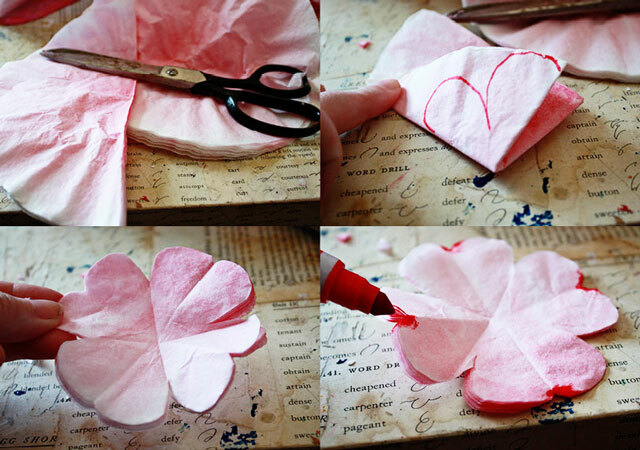 Form a stack of 5 filters and a lay a leaf shape on top. Staple FOUR TIMES creating a box like shape in the center. 3. Turn the stack over so that the underside of the staples is facing up. 4. Use your fingers to pull the filters up toward the center and pinch them slightly. Some people like to twist a bit, but for simplicity sake, only pinching is needed for the filters to keep their shape. If you have never worked with filters before, you will be surprised how easily they hold their shape. 5. Grab the next layer down, and pinch toward the center. 6. Tada! A coffee filter flower. Repeat as desired. Both hats here feature 9 flowers. I could have gotten away with five, or packed as many as 15. But 9 seems a healthy bunch to me. 1. Turn on your hot glue gun. If you have never worked with hot glue before, relax. Keep some ice water nearby in case you burn yourself. 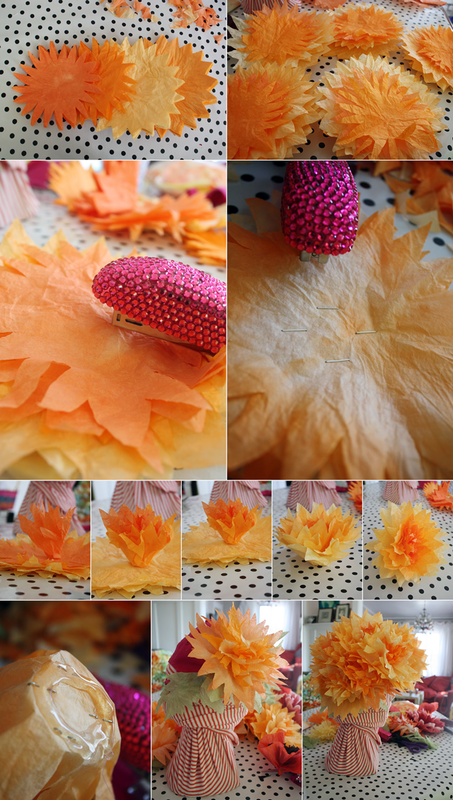 If you are doing this project with kids, you might want to look into a low-temperature glue gun. They run around $15 whereas standard mini glue guns like mine run $3-$5, and glue sticks average around 10 cents a piece. 2. Squirt a quarter sized patch of glue toward the bottom of the cup. 3. Quickly adhere the bottom of a coffee filter to the glue, hold ten seconds, and move on to the next. Assembly will be a lot easier of you work from the bottom, forming a lose spiral along the outer wall of the cup. 4. Wear on a slight forward angle. Because you are jaunty like that. How cute is that? And easy too. Once you have the filters dyed and ready to go, it’s easy to form an assembly line and make a bunch! I really want someone to make these for their bridesmaids. Or have your bridesmaids over and let them make them. Maybe at the bridal shower. 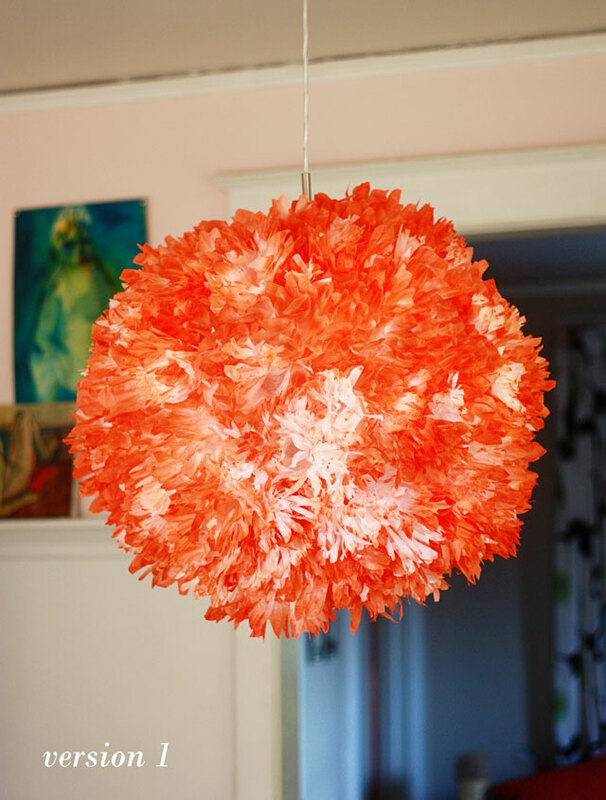 Maybe everyone makes them as a bridal shower craft activity. 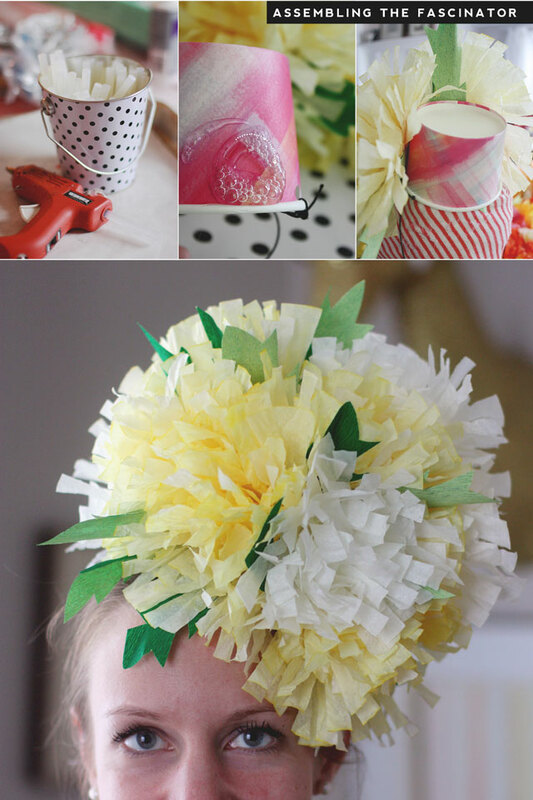 Oh Hell, screw the bridal shower and have your pals over for pizza and margaritas AND HAT MAKING. Y’all can watch The Real Housewives of Somethingorother and take pictures of how cute you look wearing these awesome things. I mean really, is that the cutest thing you ever did see? Now you say, Why yes, yes indeed, that IS the cutest thing I ever did see! And don’t restrict yourself to the ladies. 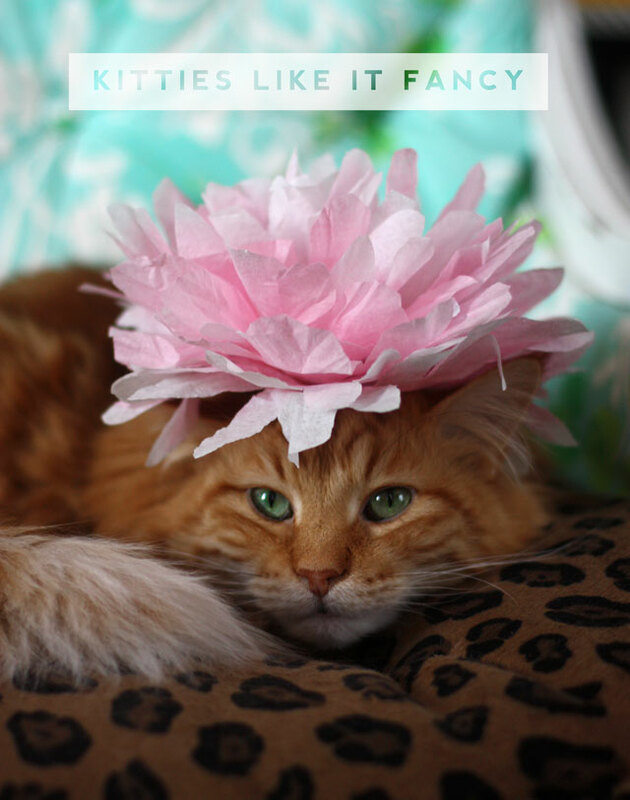 Gentlemen love a good hat too, as do cats. My Lolabelle loves a good hat. Can’t get enough. 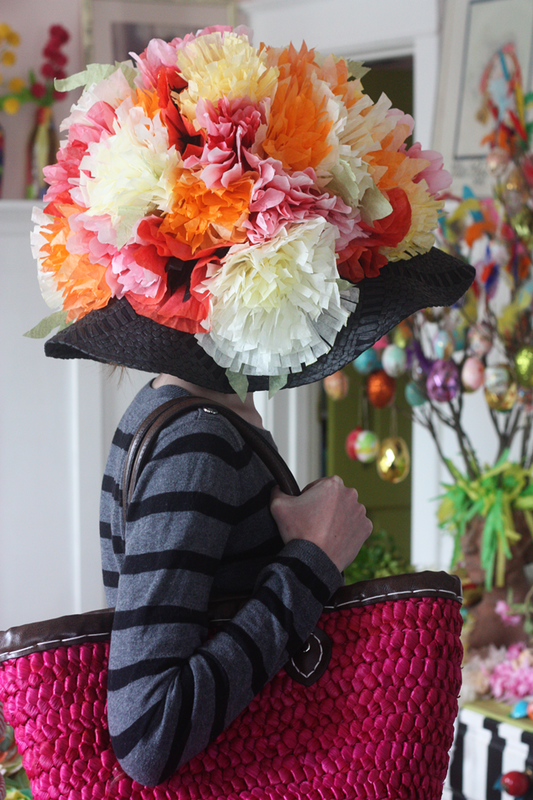 Stay tuned next week for Easter Bonnets Part Deux: The Big Kahuna. 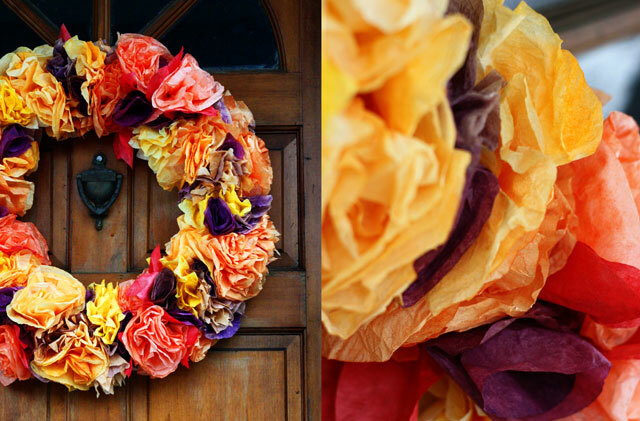 As mentioned earlier, I set out to make a beautiful, traditional, autumnal style wreath. It came out looking like something I won at a booth outside the Mexican Circus. In fact, I’ll admit I have spent a lot of money trying to win stuff from booths outside the Mexican Circus. This wreath just isn’t doing anything for my seasonal case of turkey fever. Guess I’ll have to make up for it in Chocolate Turkey Cake. 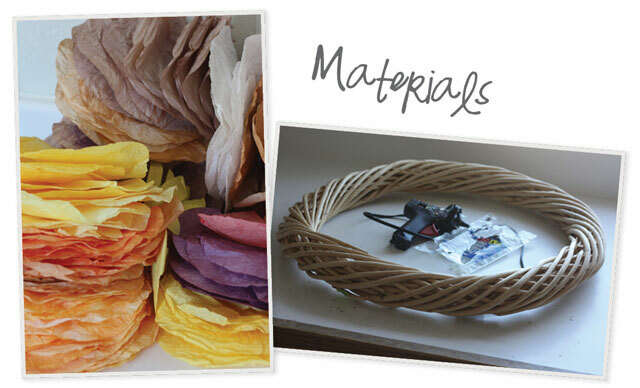 Just the same, this wreath was quick, easy and CHEAP –why not share? Any Basic Wreath Form: $1 at Goodwill! Woot! 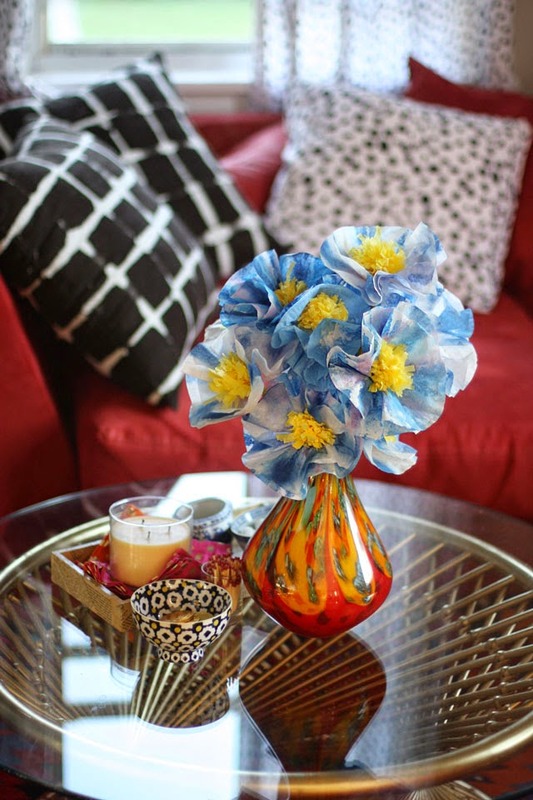 200 Coffee filters: $1 at the Dollar store! Woot! 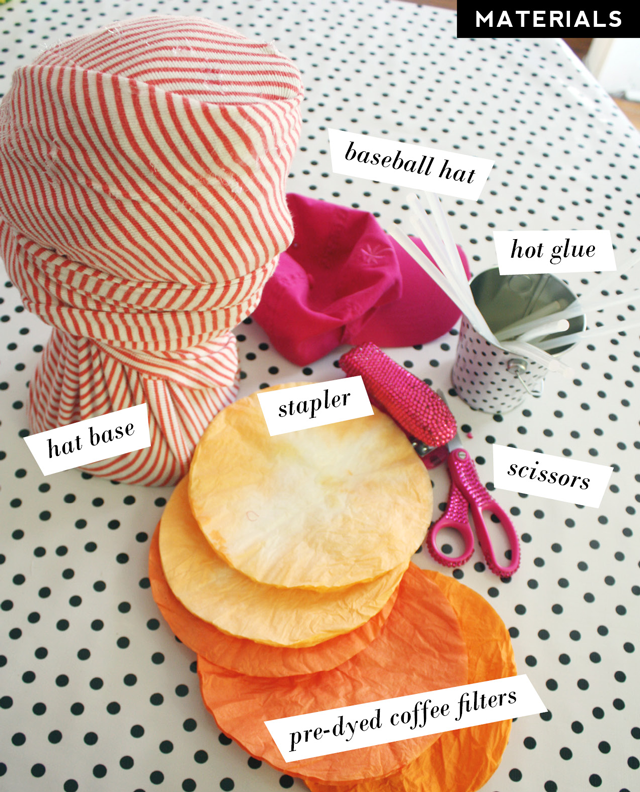 How do I dye coffee filters? Easy Answer 1: Click here. Easy Answer 2: get a stack of 50 filters, run them under water, squish out water, add paint, squish out more water, add paint, squish out more water, and repeat til they look how you want them. Try it! People ask me for specific dye recipes but I have long given up –every coffee filter brand contains a different level of starch or something that effects the rate of absorption. You will just have to try yourself. It’s very easy. This dog won’t bite. I promise! 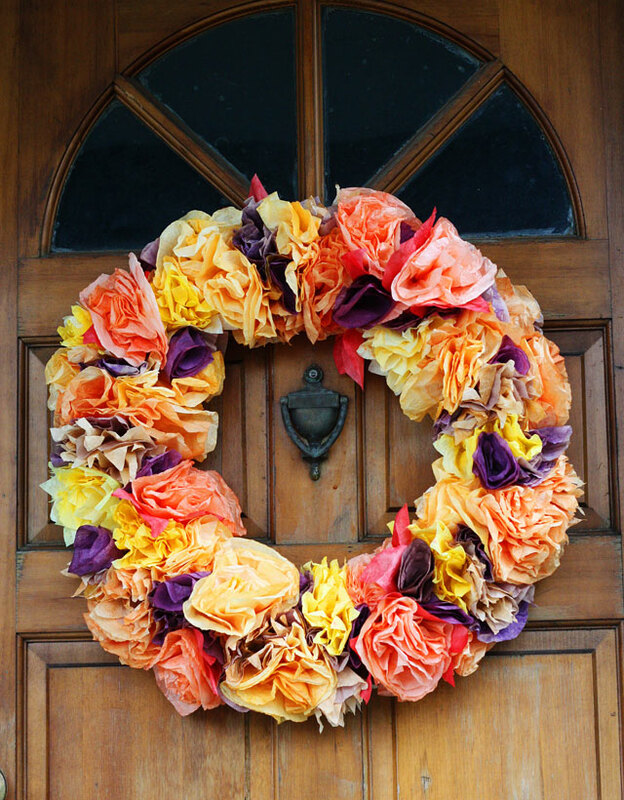 For this wreath, I made 35 flowers of varying size and color. It was over and done before I finished The Muppets Take Manhattan. Results! Want some variety? Fold the filters in quarters and trim the edges. I also made a few purple accent roses just by twisting and pinching (will do a follow up tutorial if anyone is interested). It’s fun. A little funky. And very gobble gobble. Between feedback from you guys and Google Analytics, my best guess is that well-over half of y’all came here through an outside post on my coffee filter flowers. It’s been months since I have made a single flower, but not a day goes by that I don’t read a comment, inquiry or question about them. For a while now, I’ll admit I have *almost* felt slightly resentful about it, but somehow I am OK now. Some people are known for their talents, some for their skills, some are known for their story….I will be known for my coffee filters. It’s strange, but I’m embracing it. 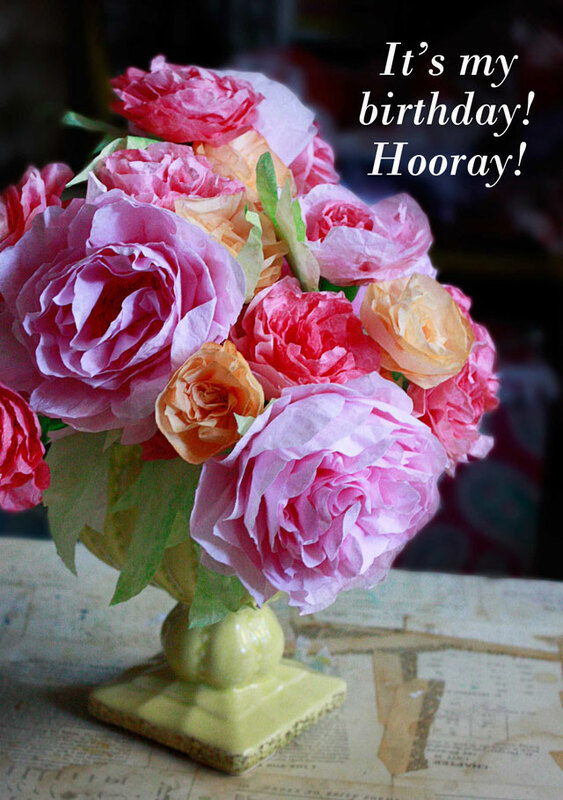 It is my birthday and I am embracing it! So, with that in mind, I’m just going with the crowd, get back in the habit, and give some away. 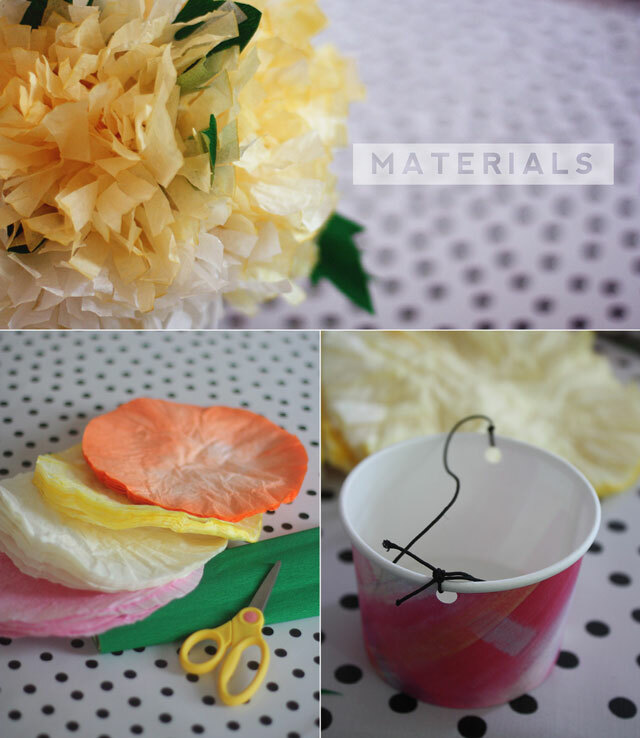 Two Dozen Coffee Filter Flowers, handmade by moi, any color way you want. 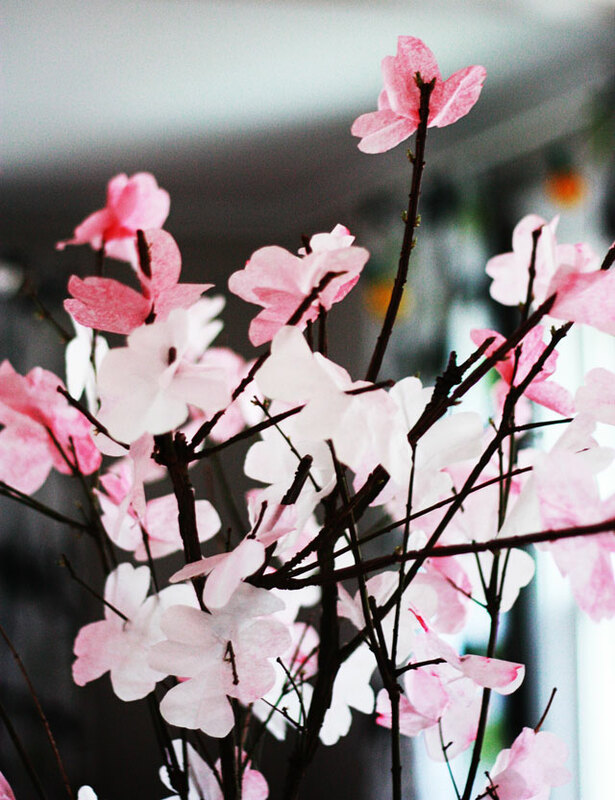 Question: What is your favorite flower and why? 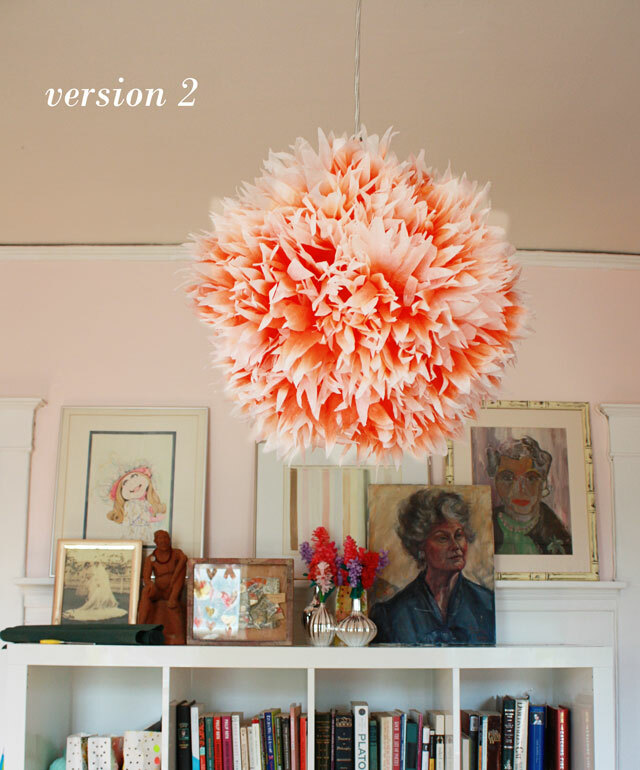 Kelly and I swapped projects last week: she sent me a Pippi Longstocking Flamingo, I sent her this flowered lampshade. 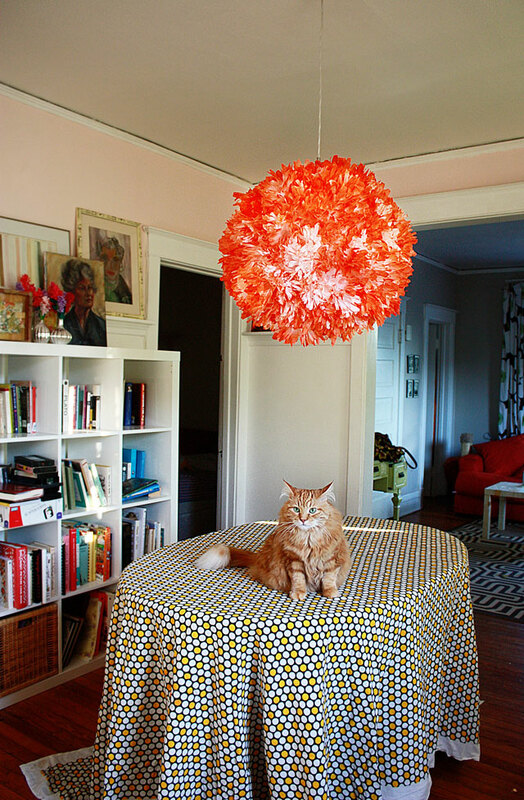 I was thinking my lampshade was pretty neato, but let’s be honest–it’s no Pippi Flamingo! Thanks again to Kelly for signing up to swap. This was too much fun! Update: By popular request, here is the scoop on the thatched paper wall and the pillow featured above.